That’s what Chimney Safety Institute of America Instructor Michael Segerstrom tells 29 students as they react to one of the most anticipated demonstrations that are part of National Chimney Sweep Training School. The idea is to show chimney sweeps what occurs, often unseen, within the chimney flue that is responsible for venting smoke from fireplaces and wood stoves. That scenario is a chimney flue fire. 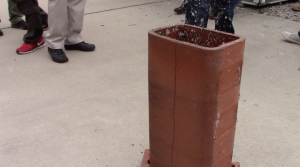 MORE: See the video we took in March 2015 of a thermal shock demonstration. That’s why a clay liner in a chimney is not intended for combustion. It is intended to vent the flue gasses from the outside. What was unique about this week’s demonstration is that the tile didn’t explode or break apart, as it has in the past. It stayed firm and began to close back up. Segerstrom was able to put a thin receipt in the wedge. “Sometimes the tiles will actually explode [watch that video!] when we are out here doing the demonstration, but this is actually good. If (during a routine inspection of a customer’s home) the chimney is dirty a little bit on the inside we might not even see the crack, especially if it was from a recent event where there was no erosion or repeated expansion of it, it closes up and disappears. On the outside, you can see it but from the inside with a little bit of soot … you might not even see it. The students tried to pull the receipt out of the tile and couldn’t get it out without ripping it. It was wedged in tight! 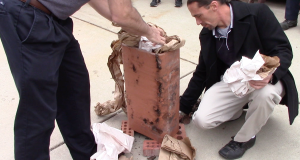 At CSIA, we teach students how to recognize evidence of a chimney fire and how to approach fixing it (including documentation and potentially contacting an insurance company first!) Students also get to witness the effects of a full chimney fire scenario, including this new video, “Chimney flue fire,” also shot in March 2015 during the NCSTS.